For any EMR deployment, staff training is essential to project success, and it is important to ensure that all staff have are capable of using the system at the point of work before starting to use the system. Region Zealand decided to buy a new competence management solution to support both their current education and training set-up and to overcome the required high training standards and timeline before the new EPJ goes live. The challenge was a major educational task, where every employee would get assigned to a training plan that matched their work role, their physical workplace and their work schedule. Furthermore, the administration had to ensure that the healthcare professionals, teachers and mix of super users are assigned to be in the right place at the right time. 50% of employees were expected to rebook at at least one seminar event. Rebooking is complex due to a very strict order of courses and the tight schedule for education to be completed. The solution consist of Dossier as a competence management system and the course management platform Totara Learn. All training and courses were organised as Dossier competency requirements in Dossier competency plans. Using Dossier’s analytics capabilities, managers could monitor progress and compliance for every competence requirement for every employee in one place. Moving forward they will be able to easily manage recertifications, making sure all relevant staff are competent EMR users at the point of work at all times. 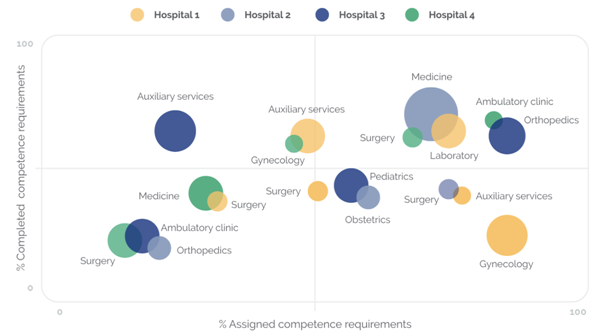 Illustration: Matrix showing assigned/completed competence requirements across hospitals and departments. Random data. Furthermore, due to the tight timeline and last-minute changes for bookings, a course rebooking solution was developed so rebooking can be managed directly in the LMS interface by admins and managers. The solution handles course sequences/dependencies and solves potential booking conflicts.Healthcare professionals and teacher needed to get information about rebooking or cancellation on their phone, so new functionality for supporting and delivering SMS services was also developed to meet the complex logistical requirements. Region Zealand was very happy with the solution, which met project requirements and contributed to the success story that is Region Zealand's EMR deployment. "The solution has increased the quality and efficiency of the administration of the major education task related to the Sundhedsplatformen ('Healthcare Platform', EPJ system). We have had a big win in following up and tracking the education pace down on employee level and in a helicopter perspective." All scheduled learning was completed on time, and to date, around 300,000 courses have been completed, along with 80,000 seminar events, 259.000 e-learning courses and 25,000 programmes. "The rebooking functionality helped us handle the otherwise complex training task and tight deadline. We had feared a high margin of error on the many rebookings, but it turned out that our biggest problem with go-live was that there were not enough sandwiches!"